When I encountered the Corpora in Si(gh)te project for the first time (in fact, the photos of the structure, named Corpora so arbitrarily and wittily by biologist Beáta Oborny, author of one of these texts), the image came into my mind of a house I had seen in a small Italian village on the banks of Lake Como. I spent a good part of my summers here, year in year out, obsessively taking refuge and returning to this group of houses still being built with Stone Age ingenuity, scattered in tight clumps across the mountainside, like a colony of mushrooms1 . Next door to me was an abandoned peasant house – multi-level, with walls and roof hewn from local shale shot through with mica – with a cave-like cellar hollowed from the rock, in which a mountain rivulet provided natural refrigeration. 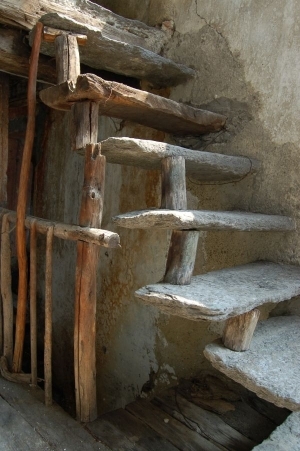 The levels were connected by cantilevered slate steps planted in the walls and propped from step to step with short logs, not trusting in the otherwise outstanding structural capacities of stone. When looking at the images of the Corpora structure I thought of this staircase, with its pragmatic, over-designed structure and its un-designed (indeed un-designable) aesthetics. It was from the examination of similar constructions – organic structures, cities and configurations which adapt to their environment – that the doubleNegatives Architectures group commenced research inspired by the concept of “architecture without architects”, first promoted by Bernard Rudofsky2 . In the course of this research into architectures lacking central design direction, they rethought the relationship between architect/architecture and construction, both in a technological and a conceptual sense. 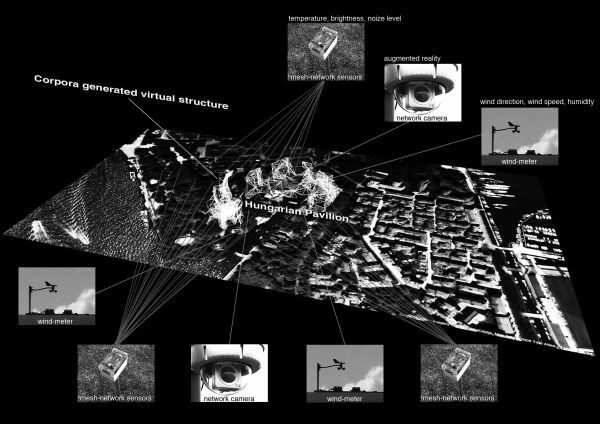 What can an architecture equipped with digital materiel learn from settlements hollowed out from the Cappadocian cliffs, wasps’ nests, or for that matter the structure of anthills? The architectural-media art project entitled Corpora in Si(gh)te, on display in the Hungarian Pavilion at the 11th International Architecture Exhibition, La Biennale di Venezia, models the potentialities of a new type of design approach based on real-time incoming information, with the application of a unique notation/ projection system. The Corpora structure relates to its environment as a living structure and reacts to its changes, thus offering the vision of an architecture in vital, dynamic harmony with its surroundings. What happens if we place the Hungarian Pavilion and Corpora, as two found objects, in coexistence? What kinds of consequence result from this curatorial act? And just why is Corpora in the Hungarian Pavilion at all? In truth the Corpora project breaches the organising principle of pavilions separated according to national identity: we have placed our sensors and other equipment in the surroundings of the Hungarian Pavilion, requesting the cooperation of neighbouring pavilions in accommodating these devices. In this way we have in a virtual sense expanded out across the public spaces of the park that is Giardini di Biennale; we have also questioned the viability of the notion of a national pavilion as the vehicle for a given concept. DoubleNegatives Architecture is an interna¬ tional (Japanese-Swiss-Hungarian) creative team operating on the boundaries between architecture and media art. Japanese architect Sota Ichikawa established the group in 1998, and in addition to him the founders of Corpora are Kaoru Kobata (JP), Ákos Marói (HU) and Max Reiner (CH). The members rarely meet in person, exchanging thoughts and developing projects over the internet, so their real headquarters is the World Wide Web itself. The curator intends that the symbiosis between Géza Maróti’s secessionist Hungarian National Pavilion (built 1906-09, but altered several times since) and the Corpora structure should generate a dialogue of interpretational possibilities between examples of organic architecture that differ in period, tradition and technology, but are closer in terms of approach. As a visual artist, I treat my curatorial role – in essence mediational – as one of conceptual creation: in this case that of the symbiotic installation comprising the Hungarian Pavilion and Corpora. 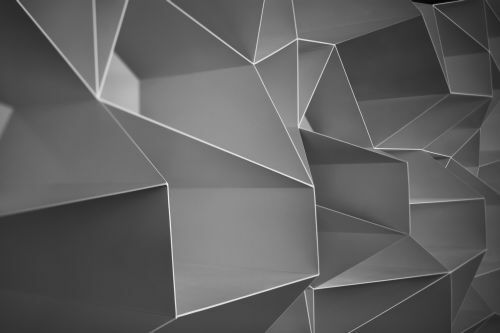 Two Corpora structures are built in parallel: one based on the dimensional data of the original pavilion, and another based on real-time incoming data. As a result, the edifice housing the exhibition also appears in multiple temporal planes within its generated architecture. With the first European presentation of their ‘Corpora in Si(gh)te’ project adapted to the Hungarian Pavilion in Venice, the creators in doubleNegatives Architecture (dNA) have signalled a shift towards traditional architectural thinking. We are witness to the convergence of architecture, design and media art. We have advanced in the direction of buildings that behave organically, interactively speaking with their environment, following changing human requirements, in the course of which a holistic approach supersedes secularised viewpoints deriving from the division of tasks and labour. This approach perceives digital space as natural, and an integral part of the environment. Let this be the departure point for the discourse engaging with the fundamental theme of the 11th International Architecture Exhibition La Biennale di Venezia, and not only the narrowest definition of architecture. The biological aspect is self-evident. 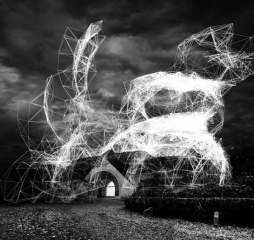 Designers/programmers pursuing the practice of generative architecture encounter a host of philosophical, ethical and aesthetic problems. They can disregard them, but the responsibility will be theirs, even they are only building files. Science-fiction utopias and cyberpunk visions flash onto our bookshelves, designed with the aid of computers4, also significantly influencing architectural thinking. Smart houses; spaces that change according to our mood; convertible buildings and objects; wetware; liquid architecture; nanorobotics; biocybernetic reproduction; the concepts and practice of transarchi¬ tecture, linked with such thinkers and artists as Rudy Rucker, William Gibson, William J. Mitchell, Neil Spiller, Marcos Novak, Toyo Ito, Frei Otto: the list goes on. Other initiatives akin to the spirit of Corpora (even if in different aspects) are the Parazita (‘Parasite’) architecture-art of András Kapitány5 , Attila Csörgő’s sculptural-geometrical spatial experiments inspired by Buckminster Fuller6, and Dániel Erdély’s7 “Spidron” global modelling system. In her essay entitled Millennial Architecture8 , Katalin Moscu quotes Ignasi de Solŕ-Morales: “Does there exist an architecture that is liquid in its material, formed according to change rather than stability, thus coexisting with the fluid and mutable nature of reality? Can we imagine an architecture that is temporal rather than spatial? An architecture whose aim would not be expansion in space, but arrangement according to motion and passage of time?” She continues thus: “While in the real world this is just an idea, in virtual spacethere is no obstacle to the realisation of such an architecture, and it has already come into being. this is precisely what Marcos Novak and Ben van Berkel do: they design houses that continually metamorphose in accordance with the changing demands of the user and the impact of the environment.” Let us add that the Corpora in Si(gh)te project also points in this direction, defining the practice of land-surveying architecture, and creating a new quality of spatial perception through the Super eye system. Where here are the fundamental axioms of Vitruvius: utilitas, firmitas et venustas? The virtual materialises, matter virtualises, just as in Neil Spiller’s cyber-alchemical architectural vision: the age of transformability – omnipotent transmutability that abolishes stationary objectivity – has arrived, in which the environment and our relationship to it also become relative. We, too, influence the building, just as the intelligent, transactive building puts forward propositions and argues with us. The question is: do we really/ virtually live in the building, or does it actually live in us? But rather than evoking creatures from science fiction, let us interrupt the Corpora program at a chosen moment and give a code to the algorithm; with this, the nearly horizontal elements within a given space (slightly adjusted according to the generated plan and assembled by a skilful welder) can provide us with an object suitable for, say, a bookshelf. 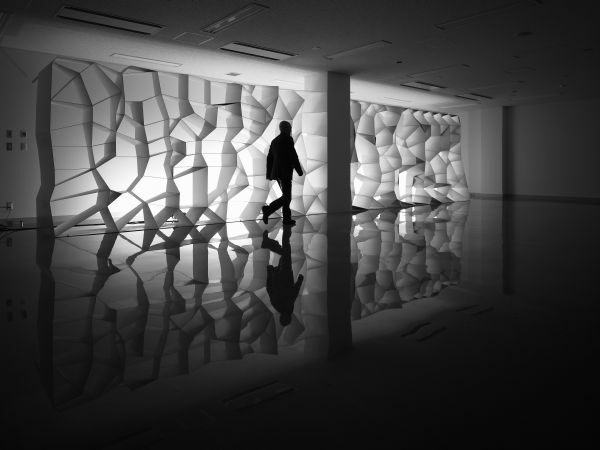 Such is the “Algorithmic Wall” by doubleNegatives Architecture at the Tama Art University9 : an interrupted moment in the Corpora structure, adapted for use. It is useful, enduring and beautiful, just like my favourite staircase in Piannelo de Lario, in the stone house next to Lake Como. In dNA’s Corpora in Si(gh)te installation, the software-programmed, autonomous structural nodes are capable of transforming into subjective viewpoints in space, which uninterruptedly modify their relationship with every single neighbouring structural node. In accordance with the ensuing changes in the physical environment, they create and rearrange their own copies, or destroy each other. Furthermore, the act of redesigning continually occurs in the vicinity of every single node. The blog www.corpora.hu is also a part of the artwork; it has followed the evolution of the Corpora project in the form of a journal, and it will continue to do so.